Conservation organisations and governments often use charismatic megafauna as surrogates to represent broader biodiversity. While these species are primarily selected as “flagships” for marketing campaigns, it is important to evaluate their surrogacy potential, i.e., the extent to which their protection benefits other biodiversity elements. Four charismatic megafauna species are used as surrogates in the megadiverse island of Sumatra: the Sumatran tiger Panthera tigris sumatrae, Sumatran elephant Elephas maximus sumatranus, Sumatran orangutan Pongo abelii and Sumatran rhinoceros Dicerorhinus sumatrensis. We examined how well each of these species performed in representing the distribution of all co‐occurring terrestrial mammal species on the island, and the priority areas for the conservation of three facets of mammalian biodiversity (taxonomic, phylogenetic and functional). We used habitat suitability models to represent the distribution of 184 terrestrial mammal species, 160 phylogenetic groups and 74 functional trait groups. We then identified priority conservation areas using the spatial prioritisation software Zonation. We found that the habitat overlaps between each of the four charismatic species and the other mammal species varied, ranging from a mean of 52% (SD = 27%) for the tiger to 2% (SD = 2%) for the rhino. Combining the four species together only improved the representation levels marginally compared to only using the tiger. Among the four charismatic megafauna species, the extent of suitable habitat of Sumatran tiger covered the highest proportion of priority conservation areas. The Sumatran tiger also outperformed most of other mammal species with similar range sizes. We found that some of the top‐ranked conservation areas for taxonomic (28%), phylogenetic (8%) and functional diversity (19%) did not overlap with any of the charismatic species’ suitable habitat. Synthesis and applications. Wide‐ranging charismatic species can represent broader mammalian biodiversity, but they may miss some key areas with high biodiversity importance. We suggest that a combination of systematic spatial prioritisation and surrogacy analyses are important in order to determine the allocation of conservation resources in biodiversity‐rich areas such as Sumatra, where an expansion of the protected area network is required. Recently, the Albanian Government started the process to join the European Union. This process also involves matching the EU parameters in protecting its biodiversity. In order to support the Albanian authorities, the Italian Ministry of Foreign Affairs, General Directorate for Development Cooperation (DGCS) and the International Union for Conservation of Nature (IUCN) joined efforts in the project “Institutional Support to the Albanian Ministry of Environment, Forest and Water Administration for Sustainable Biodiversity Conservation and Use in Protected Areas”. This project aims at identifying priority needs in safeguarding ecosystem services and biodiversity conservation. Another project funded by the EU – “Strengthening capacity in National Nature Protection – preparation for Natura 2000 network” – started in 2015 with the aim to raise awareness for assisting local and national Albanian institutions to better exploit the potential of protected areas. One of the main issues encountered during these projects was the need for a national biodiversity data repository. The Biodiversity National Network of Albania (BioNNA) has been created to aggregate occurrence records of plants and animals and aims at becoming the most relevant source of information for biodiversity data as far as Albania is concerned. In this paper, the authors detail structure and data of BioNNA, including the process of data gathering and aggregation, taxonomic coverage, software details and WebGIS development. BioNNA is a milestone on the path towards Albania’s inclusion in the EU and has also a relevant potential social relevance for improving people’s awareness on the importance of biodiversity in the country. Pacifici M., Visconti P., Scepi E., Hausmann A., Attorre F., Grant R. & Rondinini C. (2015). 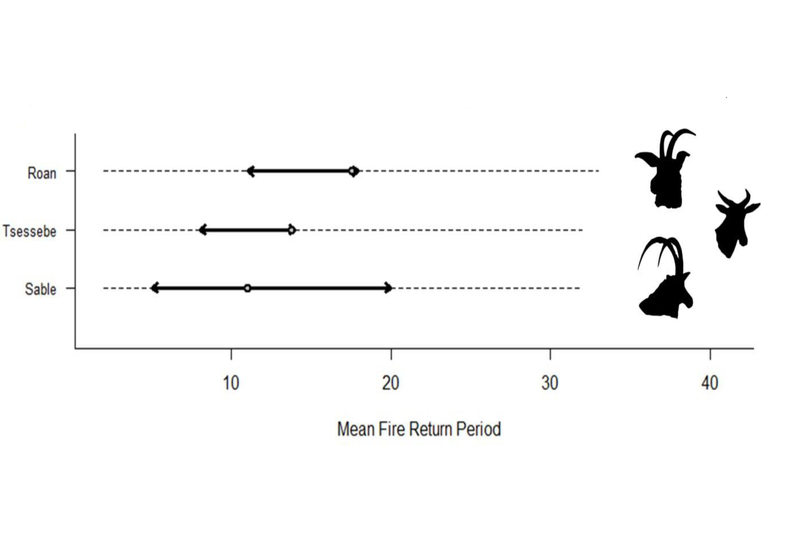 Fire policy optimization to maximize suitable habitat for locally rare species under different climatic conditions: A case study of antelopes in the Kruger National Park. Fire is a key ecosystem driver in savannahs and it can have large impacts on species distribution and density. A re-examination of fire management in Kruger National Park is currently under review with the objective to maintain natural ecosystem dynamics and favour tourists’ ability to observe animals. We used data on location, intensity and frequency of fires and census data on three species considered as rare and of conservation concern in the park, tsessebe, roan and sable antelope to estimate the relationship between fire occurrence and species occurrence and density. We also investigated the impacts of different environmental predictors on antelope populations. The model predictors that most affected the density and presence of antelopes were mean fire return period, the type of geological substrate and the presence of water-points. We then used our models to evaluate different fire management scenarios and make recommendations for an optimal fire management strategy for the conservation of these rare antelopes. We also tested our scenarios under different precipitation conditions, in order to investigate the likely response of species to climate change. Roan antelope is the most sensitive species to climatic variations, while sable seems to be the most resilient. The approach described here can also be used to improve the conservation of locally rare species in other regions and habitats.